This sounds delicious! I have a question. Once you are ready to cook the turkey, do you remove the salt that you put on the skin to brine? there actually won’t be any salt to remove…during the brining process, it soaks into the bird…you actually might even see some changes over the 3 days, where this more moisture and then less moisture. just let it do its thing. It’s kind of a magical process! hope that is helpful! let me know if you have any other questions! Not a big mayo fan – what does that do and is it necessary? I know, I know – the mayo thing sounds WEIRD. but I swear that your turkey will 100% absolutely NOT taste like mayonnaise. 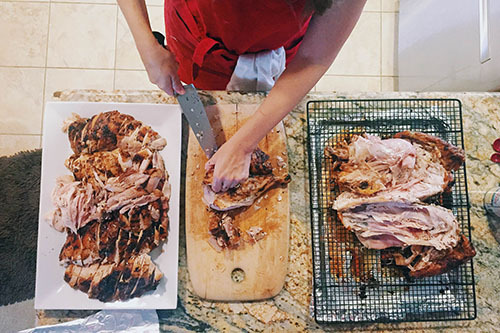 you’re basically basting the turkey in a sauce made from oil, egg yolk and an acid (like vinegar)…it yields tasty, moist turkey with a really beautiful crust. good luck with the turkey cooking! I saw this turkey post a year ago and it was in the back of my mind until November rolled around again. I thought it was a crazy way to prepare a turkey but I was intrigued. We followed your suggestions and even smeared the whole thing in mayo. It was the best turkey we have ever made and we have made many turkeys through the years. A huge thank you for sharing this keeper of a recipe! You’re so welcome and I am SO glad you decided to give my crazy turkey instructions a try! Thank you so much for letting us know how it went! 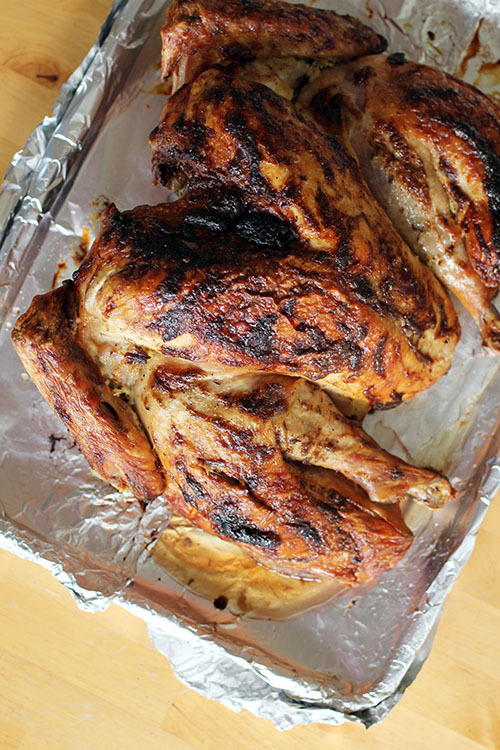 Jame – my husband made this turkey and it was the best! thank you for sharing this recipe. Oh, I am so happy to hear that! Yay! Thank you for letting me know, and you’re welcome! I came across your site while I was looking for different kitchen/baking tips. As I scanned through the pages, and with turkey day (AKA Thanksgiving) just around the corner, this post inevitably caught my eye. The more I read, the more I thought, “How odd, strange, wacky”¦I’m intrigued!” I have one question, though. What if you only have a frozen bird available? Can I thaw it out and continue on from there? Could it still work, or do I need another bird altogether? Here are my thoughts – you should be able to follow the process once you have the turkey thawed for sure. One thing to look out for – if the turkey is pre-brined or not. If it IS pre-brined (many frozen turkeys are), then I would skip the dry brining step and head straight to the spatchcocking and mayonnaise 🙂 If it is NOT brined, then you should be good to go with dry brining the bird once it is thawed. If that is the case, be sure you start thawing the turkey early enough you have enough days for thawing AND brining. Wow! That looks amazing. I am not hosting Thanksgiving, but it makes me want to cook a turkey. 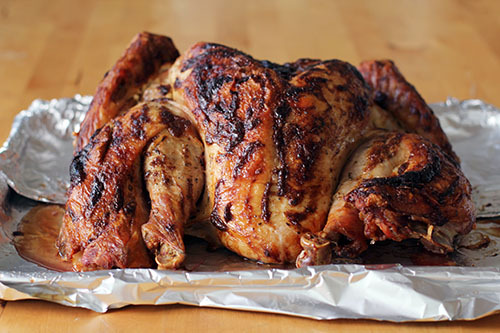 This made the best turkey ever this year, love this recipe! Thanks!!! YAY!!!!!!!!!!!!!!!!!!!!!!! That makes me HAPPY!